Much as I wanted to go back to the desert for a fourth year as a Ranger, domestic ties proved stronger. It didn't seem fair to subject my infant son Isaac to the rigors (and dangers) of the heat, the dehydration, and the alkali dust from the playa. So this year I decided to telecommute to the event. After all, I had just had DSL (Digital Subscriber Line) connected to the house and the nice folks at Pacific Bell said I'd get a guaranteed downstream bandwidth of 1.5 mbps, surely enough to enjoy streaming video from the playa. And I had two Apple Macintosh G3 PowerBook laptops connected to my SPARCstation 2 firewall, a setup designed for being a playa potato. Well, to make a long story short ("TOO LATE! 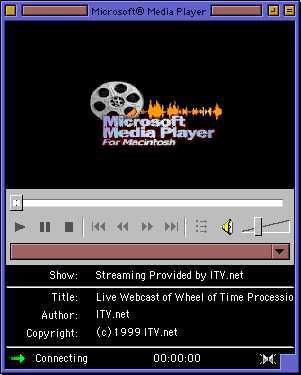 "), we fired up the standalone Microsoft Media Player for Macintosh and got streaming nothing. Since the archived video also suffers this fate, I'm guessing that there's a conflict between MMP and MacOS 8.6. So it goes. Anyway, there are lots of photos of Burning Man 1999 available on the web for you to find an enjoy. Perhaps our little family will rent a recreational vehicle and tour up to Burning Man 2000 in style. And air conditioning for the little tyke.